New York transit ads: Agency bans political messages after order to include "Hamas Killing Jews" ads. 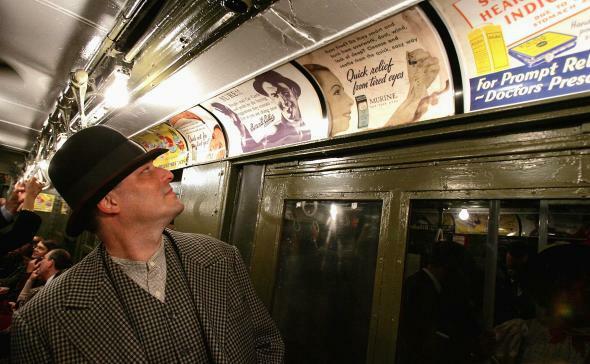 Scott Prendergast, a Metropolitan Transportation Authority employee, rides on a vintage New York subway car while dressed in period costume. Starting immediately, no ad with a “viewpoint” will be found on any MTA vehicles or property. All political advertisements will soon be banned on New York public transportation following a vote on Wednesday by the board of the city’s Metropolitan Transportation Authority, NBC4 reports. The vote came after a judge ruled that the agency could not reject a provocative advertisement attacking Muslims submitted to appear on the nation’s largest public transit system by conservative activist Pamela Geller. Geller has launched legal challenges against other cities for attempting to keep her advertisements off of their trains and buses as well. Philadelphia instituted a complete ban on political ads on mass transit when a judge ruled that the agency could not reject ads from Geller’s American Freedom Defense Initiative that included photos of Muslim leaders meeting with Adolph Hitler and the text “Islamic Jew-Hatred: It’s In the Quran.” Those advertisements have made it onto public transit elsewhere, running for a month on buses in Washington, DC in 2014. Geller was joined by Chris Dunn of the New York Civil Liberties Union, who cited the role of subways and buses in the lives of New Yorkers in arguing against the political ad ban. The New York City transit system is our public square. It is where virtually all of us pass through day in and day out. And because of that, it is a central part of our free speech in New York City. And given our commitment to free speech in this country, it is unconscionable that you are thinking of banning political ads from the transit system. This proposal is small-minded, it’s intolerant, and it violates everything we stand for as a city and a country… If a hateful political ad runs on some buses for a few weeks and creates a controversy, we will all survive that. But if you ban all political ads in New York City, that will be a grevious blow to all of us and it will be an indeliable stain on the MTA and on the State of New York. Geller and Dunn did not appear to sway many minds on the board in their favor. The ban on political advertising on MTA property was approved overwhelmingly and will go into effect “immediately,” a transit spokesman told the Washington Post. Geller said on her blog that she’s confident she will prevail on appeal.